The NEC Online and Live Auctions are SGMP’s largest fundraising events to benefit The Gilmer Institute of Learning Scholarships for NEC. 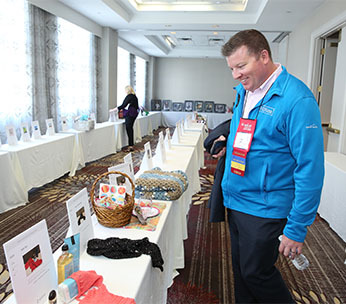 While the live auction will take place in Detroit, MI, during 2019 NEC, you can get involved and participate from anywhere with our online auction, which will launch in advance of the conference festivities. Watch for the auction opening announcement! Arrive early or extend your stay in Detroit, the host of 2019 NEC, by bidding on a Visit Detroit “Stay and Play” package valued at $900. The pre-auction will open Tuesday, March 5, at 8 am ET and close Thursday, March 7, at 5 pm ET. See the full listing and place your bid visit: https://2019NEC.givesmart.com. We are currently requesting items for the SGMP Online and Live Auction, which will go live in June 2019. This national fundraiser makes it possible to fund scholarships for government and contract planners to attend this national gathering. We are requesting all kinds of donations! Vacation Packages: Consider offering a 2-nights to a 7-nights stay with breakfast or food credit, golf or spa package. Don’t be afraid to think outside the box! Donate one of your unique handcrafted creations. Please think about combining items or services with your friends and colleagues to create a tantalizing package to feature your area, such as a hotel 2 or 3 night stays with a spa visit or round of golf. Let your imagination be your guide. All bidding will be done through a cell phone or computer. Auction participants can bid from anywhere, anytime before the close of the auction, right from their own device. This means, the auction item will be promoted to ALL members and potentially their friends and family. Specific auction instructions will be coming soon, so be sure to check back in and cast your bid! The live auction will be held during 2019 NEC following the Sam Gilmer Awards Dinner. We welcome contributions of larger items for this charitable auction. Please do not mail large items to Mark. If you are donating an item larger than a gift certificate, please mail the item to the winner after the NEC. If you have any questions about our ONLINE auction, please contact us. NOTE: Items over 5lbs should be shipped directly to the winner of the auction after the event and should not be brought to the conference. Please DO NOT ship large items to Mark Richardson. Please submit 2-3 high-quality photos of the item in lieu of bringing the item. Thanks for helping us avoid shipping costs! Submit a high quality photos of the item in lieu of bringing the item.